The old south wall at Anping Fort in Tainan. Much ink has been spilled in recent months over the Obama administration's reluctance to sell Taiwan the 66 F-16C/D fighters it has been requesting since 2007. A final decision is expected by Oct. 2, and while many observers predict that political considerations will lead Washington to nix the deal, another factor may be at work: the penetration of almost every sector of Taiwanese society by Chinese intelligence. For the U.S. government and defense manufacturers, any arms sale to Taiwan carries the risk that sensitive military technology will end up in Beijing. This worry is not new. Anyone who has followed developments in Taiwan over the years knows how deeply Chinese forces have infiltrated Taiwan's military, especially its senior officers. For years American officials have looked on in amazement as newly retired Taiwanese generals traveled to China for a round of golf, were wined and dined by their counterparts in the People's Liberation Army, and no doubt had their inebriated brains picked for information. Taiwan's reputation has not been helped by a string of embarrassing cases involving members of the armed forces or civilians who spied for China. Some of the programs compromised involved American assistance, such as the Po Sheng "Broad Victory" upgrade to the military's command and control infrastructure. Even more damaging are the instances when culprits got away with a light sentence. Earlier this year Lai Kun-chieh, a software engineer, received a mere slap on the wrist for attempting to pass information about the PAC-3 Patriot missile defense system to China. Also puzzling is the apparent lack of coordination between border, airport, immigration, foreign affairs and defense agencies over the return to Taiwan this month of Ko-suen "Bill" Moo. Mr. Moo was a former top salesman for Lockheed Martin who was arrested in Miami in 2005 and sentenced to 6.5 years in jail for trying to sell, among other items, an entire F-16 engine to China. Taiwanese authorities failed to meet Mr. Moo at the airport on his arrival, despite being tipped off by the U.S., and haven't been able to track him down since. The 64-year-old, who was involved in the Po Sheng project, had close friends within the upper echelons of the Taiwanese air force. It is alleged that he was part of a small group within the Taiwanese Air Force known as the "gang of four," which included former Defense Minister Chen Chao-ming. President Ma, recommended J Michael, needs to clean house. This problem has been festering for years and there has been little apparent progress. Anyone in Washington who wants to deny weapons sales to Taiwan can plausibly point to this issue as an excuse not to sell the island nation weapons. However, Chinese penetration of ROC defenses is a concern to the United States and will likely be a factor in a decision whether or not to sell advanced F-16 fighter jets to the Chinese Nationalists exiled on Taiwan. It also follows the release of an alarming statistic by the Ministry of National Defense according to which more than 3,000 former Taiwan military officers are now either doing business or working in "consultancies" in mainland China. Apparently it's just not ok to draw attention to the problem in an essay length piece. Big loss of face, you know. This also raises another issue: by not making an ostentatious attempt to clean house, is the Ma Administration, which doesn't want F-16s sold to Taiwan, deliberately handing Washington an excuse that would give it plausible deniability? Probably not; one should never attribute to maliciousness what can be explained by incompetence. Rising cost of living slashes demand for adoptions. Victoria Linchong still needs financing for her pro-Taiwan film. See here and here for more information. Economic weakness: SinoPac slashes forecast for growth to 4.7% this year. Eyedoc posts some great comments from Andrew K on aboriginal marriages, the Koxinga clan, and intermixing in pre-Qing Taiwan. John Copper's piece in the National Interest on why the US needs Taiwan was picked up by Zack Beauchamp on Andrew Sullivan's blog. Zack, ya could have pointed out that Copper is a longtime supporter of the KMT and thus, while arguing that the US needs Taiwan, himself supports the party that wants to annex Taiwan to China. How's that again? BTW, for your question demanding evidence about why China would want to sail its subs off the coast of the US... please see recent history of Chinese warship sailings around Japan. Why should China want to sail in Japanese waters? And yet it does. Why does any expansionist state do what it does? Minshih English Videos on Taiwan starring Michella! Michella Jade Weng, the multiply talented anchor for FTV, is doing a series in English on places in Taiwan. I think this one on Visiting Tainan's historical Sites is the first one. Might be useful for language class or introducing Taiwan to people who don't know it. This one is on the Penghu. And here is her search for tea eggs while biking around Sun Moon Lake. A panorama of clouds across the central mountain range before the arrival of typhoon Nanmodol in Taichung yesterday, taken at the Taichung HSR station around 11:00 am (original size). Global Views' latest survey on the Ma-Tsai election bout is in, dated Aug 23. In head to head combat, it has Ma 39.6% to 38.1% with 77% of those surveyed responding. 23% are playing coy. However, with PFP Chairman and former KMTer James Soong in the race, Ma beats Tsai 35.1% to 33.9%, essentially the same gap between them. This is a slightly different outcome then several other recent polls where Tsai's support falls more than Ma's when Soong is in play. Tsai crushes Soong head to head. The figures for "Maintain the Status Quo" are intriguing. First, Ma gets high marks in that area, which explains why even though voters don't think he'll work for Taiwan's interests, they continue to vote for him. Yet both Ma and Soong are lifelong unificationist politicians (knowing that, who are the freaks who think Ma and Soong are pro-independence and Tsai pro-unification? Somebody must be having fun with the survey). This widespread and deeply ingrained idea that Ma is a status quo politician is in part a tribute to KMT messaging, but also in part to the confidence that many Taiwanese have that their country cannot be sold out. I still don't see any reason Ma will lose in 2012. But would be interested to hear some thoughtful comments on the matter. The KMT's English cheerleader in Taiwan, the China Post, headlined Court Cuts Chen's Term to Ten Months. Taiwan News said: Court overturns former leader's conviction. The pro-Beijing WantChinaTimes headlined Ex-president found not guilty of embezzling special state fund. Taiwan's government media organ Central News Agency said: Ex-president found not guilty of embezzling special state fund. AP titled Taiwan court overturns former leader's conviction. Of course, AFP, whose political sympathies will be well known to readers of my blog, ran Taiwan ex-leader gets additional jail sentence. And BBC ran much the same headline. Hint, hint. Note that the pro-KMT China Times was so disgusted with this verdict that it complained it was unfair and the judiciary had a problem. Everyone else focused on, and reacted to, the fact that he was found innocent of the embezzlement charges. Not BBC and AFP. They appeared to choose the most anti-Chen spin possible: he got an extra jail term. Taiwan's ex-President Chen Shui-bian - who is already in jail for corruption - has been given an additional sentence for money-laundering and forgery. I especially like the caption for the photo that accompanied the story. "Chen angered Beijing during his eight years in office by pushing for Taiwan's independence". BBC always reports that Chen angered Beijing -- it also says so in the article, repetition that is sheer waste. Why not a neutral caption like "Chen waves to supporters" which simply describes what is going on? Taiwan's former president Chen Shiu-bian, already jailed for bribery, was sentenced Friday to an additional two years and 10 months on separate charges of embezzlement and money laundering. Chen, who headed the island's government between 2000 and 2008, is serving a jail term of 17 years and six months on two bribery convictions in a sprawling corruption case that saw his wife Wu Shu-chen get the same sentence. The high court on Friday sentenced the couple to an extra two years for money laundering, and ordered them to return $6.8 million and Tw$100 million they had pocketed in domestic and overseas deals. It also handed down a 10-month sentence for forgery in a case related to embezzlement of state funds. Even the BBC piece admits further down that he was found innocent of the embezzlement charge. But the AFP report simply omits the key fact that almost everyone else placed at the center of their story: Chen was acquitted of embezzlement of the special state funds on retrial. The "documents forgery" of the BBC and "forgery" of the AFP report refer to the conviction for "forged" receipts. Originally the regulations did not require that the President submit receipts for use of the state funds. After Chen became President, the rules were changed. Naturally, since the slush fund was used for all sorts of secret stuff, the receipts were not kosher. Do spies and diplomats give receipts? None of the international media reports I've seen on the Chen case, when they refer to the bribery charge, have reported that the Koo family testified in May in court that prosecutors had coerced the testimony on the bribery case. Have I misunderstood that? Did this event not occur? (report). At present, as I recall, Chen is in prison on the charge of accepting bribes from Diana Chen to make her chief administrator of Taipei 101, for money laundering, for receipt forgery, and for the land corruption case involving the Koos. Anything else? I mean besides being pro-Taiwan. Police harass farmers protesting land seizures. Huge news in Taiwan at the moment: HIV-infected organs from suicide implanted in five donors. CNA become little more than pro-KMT blog? As you know, in March and April I did spent 15 days in Pingtung riding around for a Pingtung County tourism promotion project (Pingtung I: Magical Mountains of Pingtung, Pingtung II: Magical History Tour. Pingtung III: Kenting holiday, Pingtung IV: Under an Onion-Scented Sky). I wrote a 5,000 word piece on my travels for them, and they have put together a book called When the Scenery is Like a Poem (當景色如詩) with accounts from all of us who participated. Though what I wrote wasn't anything like poetry! Anyway, I've saved the Chinese pages as a set of images on Flickr for those of you who want to read it in Chinese. The original in English is below. A few weeks ago I got an email from someone representing the government of Pingtung County in southern Taiwan. Would I like to participate in a blogger activity ? Would I like to travel in Pingtung, stay there as a guest of the local government for 15 days, and blog on my experiences. For bucks? I couldn't say yes fast enough. It sounded like heaven. Truth to tell, I had never really been to Pingtung, except for several trips to Kenting, like everyone else in Taiwan. I was completely unfamiliar with what Pingtung might have to offer. What would I see? Where would I stay? The only thing I knew for sure was that I would do the vacation on the bike. Cycling is the best way to see a place, to meets its people, take its pulse, and enjoy immersion in its landscapes and scenery. In the mountains bikes are quiet and do not scare the animals like cars or motorcycles do. On a bike you are inviting. Consequently, people were always stopping me to ask where I was going and what I was doing. For the first three days of this trip I chose the area around Sandimen in north-central Pingtung county. The townships in this area, Sandimen and Majia, are famed for stunning mountain scenery, hiking and camping, and a variety of aboriginal cultures. The government is developing biking paths and trails along the plain at the foot of the peaks and among the small towns that dot central Pingtung, so I thought it might be a good place to start. Driving into Shuimen town on a Friday night I realized I had crossed into another world. I checked in at a small hotel in town and then strolled around the town as evening fell. Everyone was out chatting, eating dinner, barbecuing, and sharing drinks with good friends. The warm, small-town atmosphere felt great, full of relaxed, hometown energy. In the morning I moved over to the hostel at the Taiwan Indigenous Peoples Culture Park just above Shuimen on County Road 55 (Mazalu 渡假休閒旅店 http://www.mazalu.com.tw/ 08-7991678). The park is actually located in Majia Township. The views from the hostel north toward the agricultural plain and east to the mountains are excellent, and there are shops, restaurants, and a garden area. The place is clean and well run and the staff are extremely friendly. It makes a great base for exploring the surrounding area. For my first Saturday in Pingtung County I decided to take Rte 24 up into the mountains through Sandimen township and into the mountains beyond. My introduction to Pingtung was thus a gorgeous sunny day in the mountains. What could be better? I rolled down into town, grabbed some breakfast, then rode across the big bridge on Rte 24 towards Sandimen, stopping several times to snap pictures of the pretty Ailiao River Gorge. Rte 24 winds a few hundred meters up a steep slope in a series of switchbacks. Sandimen town lines the switchbacks, an array of shops, restaurants, tea houses, and bed and breakfast places. The slope, popular with local cyclists, is not difficult but it is work. On a sunny morning everyone was out having breakfast or setting up for the expected rush of customers later in the day, and I had several opportunities to stop and talk to local people on the way up. I stopped several times as I climbed to take photographs of the amazing vistas over Shuimen town and the plains to the west. As I rested and took photos, other cyclists clad in brilliant multicolored cycling clothing rocketed up the slope on expensive road bikes, waving as they passed me. It was vintage Pingtung: everyone was incredibly warm and friendly. Once you are past the town the road levels off and becomes an enjoyable climb through forested mountains. The road was empty of traffic, the day was sunny, and birds were everywhere. Soon I found myself at the police checkpoint. I rolled down into a stunning river gorge with staggering views of peaks and scarps. As I stopped to photograph the sight, a local came by on a mountain bike, and I spent a pleasant half-hour with him chatting about the problems of maintaining the roadways in Pingtung’s steep mountains. I then turned around at the long construction zone on 24 and headed back. Along the way my front rim overheated on a long downhill and I blew a tube. I decided to head over to Neipu, where there were a couple of bike shops, to get some new tubes. Along the way I stopped at the interesting Aboriginal Cultural Center on Rte 24 near the Sandimen township office. It is filled with Paiwan aborigine artifacts and photographs, and offers performances, art, and other cultural activities. It also has good views down the nearby river gorge. The flat road between Shuimen and Neipu proved to be a good introduction to Pingtung County life, with plenty of interesting things to photograph. The next day I got up early and rode Pingtung 55 up to Majia town. This road is especially beautiful, with an easy grade and great views out over the river gorge and the mountains beyond. 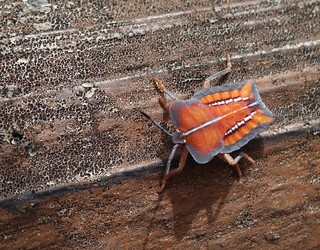 I had a wonderful time on a sunny morning, imaging everything from mountain peaks to insects. 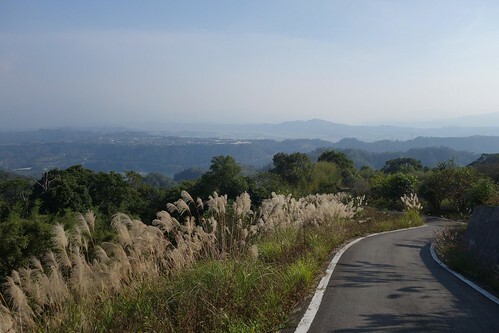 Riding it is the kind of great experience that really makes Pingtung County shine. I hope the government considers extending and connecting these roads via bike trails, and promotes this area as a tourist alternative. The road not only contains some interesting aboriginal villages and other cultural sites, but a new recreational farm as well. After lunch I headed north along Rte 185, the Along-the-Mountains Road. This is a very pretty road that is much like riding on the east coast, with a flat shelf backed by imposing mountains right over your shoulder. 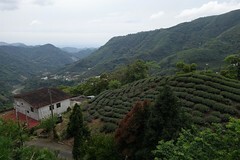 Rte 185 runs past a number of scenic areas in northeastern Pingtung County, and is lined with pineapple and banana farms, small temples, and gravel operations. Unfortunately the road surface is only in fair condition, due to the constant truck traffic. The government has put in bike paths along part of the route but they are not very useful. I advise cyclists to stick to the road. Despite the problems I highly recommend 185, a good alternative to taking Rte 1 south through Pingtung if you are cycling to Kenting. The next week I returned, determined to further explore the area. I stayed at a delightful little bed and breakfast place called Chinglu Bed and Breakfast near Jiayi village in Majjia Township, right off 185 (清廬民宿, 屏東縣瑪家鄉佳義村1鄰泰平巷5-28號, 08-799-0311). It exemplified the cultural mingling of the area – the owners were a Paiwan aborigine woman and her Hakka husband. The building itself was done in the style of an aboriginal stone house, and the interior was filled with aboriginal furniture, art, and curios. The owners were truly friendly and treated me to some really interesting experiences. Since the previous visit had involved exploring the mountains, this trip I decided to head out on a history tour of Pingtung County. 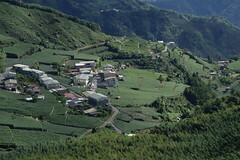 Han settlement in Pingtung is quite old – some Hakka historians claim there were Hakkas settled there as early as the 14th century or even earlier. While recent artifacts from the long history of aboriginal dominance of the plains have sadly disappeared, there are plenty of sites of interest from the 19th and 20th century. The first leg of my ride took me south along 185 (map at http://tinyurl.com/3v7l6gu). It was a gorgeous morning and the mountains off my left shoulder were lovely. Rte 185 continues all the way to Fangliao along the coast, but my first stop was the Catholic Basilica in Wanjin in Wanluan Township. The little Church with its Latin style makes visitors feel as though they are in some mission in New Mexico. There is an excellent coffee shop right next door, and people in the local community are super friendly. If you are traveling in the area a bed and breakfast should be opening in the town soon, and in an emergency you can probably get the Catholic Hostel in the Church compound to take you in for the night. Ask at the coffee shop. Because of the intermixing of Han folk religion, Aboriginal religious practice, and Christian belief, the area around Wanjin is a fascinating mélange of religious art and iconography. Do not miss the beautiful mural, not far from the Church, that is a mix of Aboriginal, Han, and Christian artistic forms. In many places statues of Mary are side by side with shrines to the Earth God, Fu De. Moreover, unlike most other townships in Taiwan, Wanluan Township does a great job putting up useful signs telling you where the interesting things are. Just south and west of Wanjin is the wonderful little village of Wugou. I went here twice because I liked it so much. Wugou is a Hakka settlement that dates from the 18th century. It retains its original town plan and many old houses. The brick and stone work is interesting, and many of the buildings still host beautiful old painted porcelain tiles, original religious art by the altars, and old wooden doors and windows. Some of the buildings are undergoing restoration. If you visit try and find Mr. Chou, who volunteers at the small tourist office there. He speaks excellent English, having spent many years working in Nigeria, and knows the town and its history well. Be sure to visit the Half Moon Pond and the old school building. From Wugou I returned to 185 and cycled south to Fangliao. The southern part of 185 has fewer trucks and is an enjoyable ride. Soon I was in Fangliao, an old fishing port on the coast. I turned north and took 17 up to Jiadong, an old Hakka settlement near the coast. In Jiadong I stopped for lunch and visited the Hsiao Family House in the center of town. This relic, restored and filled with historical exhibits and antique furniture, is well worth a visit. The dwelling of a prosperous local family, it is large and extends back from the entrance for some way. The area around the Hsiao house is a small plaza with a market and a large old temple, a pleasant place to hang out, and Jiadong town itself is filled with old style san he yuan houses. I left Jiadong after lunch and rode up to Yuguang, a small town a few kilometers away. I am a World War II history buff and I had heard that the elementary school there hosted some old air Japanese air raid shelters. 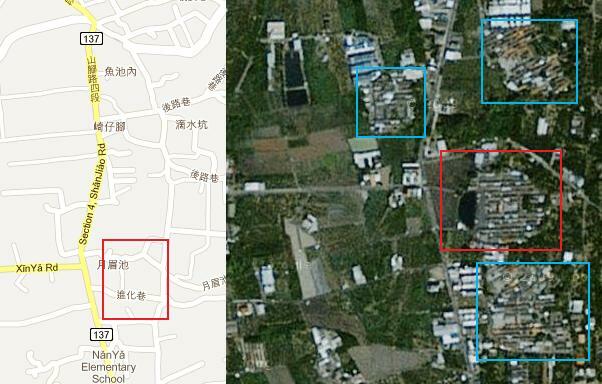 Two of them are still extant on the grounds of Yuguang elementary school. They are surprisingly small and thinly built. I could not imagine how they would survive a direct hit. From Yuguang I followed Rte 115-1 straight west past the airfield. This area has a rich connection to the Second World War: during the 1930s and 1940s it contained several Japanese air fields. Unfortunately, almost all the infrastructure is gone, but perhaps enough remains that the government might be able to stitch together a history/biking tour of central Pingtung county for the many people who are interested in that history. I biked across a long stretch of totally flat pineapple fields and fruit orchards, desolate and apparently empty of people. Suddenly I came to a four way intersection and there, down the road, was an old observation tower. But was it postwar or prewar? And if prewar, which airfield was it? I talked with a friend who is an expert on WWII history in Taiwan, and he told me that the tower was once part of Kato Airfield. It had been bombed by the Americans during the Pacific War, and after the war had served as a bombing range. Sadly, only the rusting tower is still extant. Another historical site I constantly ran across is one that extends across Pingtung County and would make a great cycle path: the old sugar railway. Still extant in many places, it is criss-crossed by roads all over central Pingtung County. In a few places local governments have ripped out the rails and put in bicycle paths. It would make an enjoyable history tour with restored infrastructure and the rails cemented in place rather than removed. After that I returned up 185 back to the bed and breakfast place. Along the way I ran across a Paiwan wedding, with everyone dressed up in Paiwan clothing and looking stunning. Later, back at the bed and breakfast, as the owner fed and watered me with tasty aboriginal foods, she got out some ceramic plates and bowls that were superbly done. I love good pottery and was quite excited, and she at once offered to take me to visit the artist. We piled into a car and drove over to Jiayi village where the artist, Legeay Maviliv (0927073630; vuvu5316 @ yahoo.com.tw) has his workshop. What a wonderful place! I took many photos and also spoke to the children taking art lessons there. When we finished there we went to a local coffee shop that specializes in Pingtung-grown coffee (http://www.wretch.cc/blog/gscf7832558). I had no idea they grew coffee in Pingtung, but the owner of the little coffee shop assured me they had been growing it there for years. The next day I went up to Taiwu township into the mountains again, to stay at Dawushan Bred and Breakfast, a lovely little place perched on a ridge about 500 meters up (大武山民宿, 屏東縣泰武鄉武潭村老潭巷40號, 08- 7920332). The owners are a married couple, one Rukai and the other Paiwan. I spent the morning wandering around Wanjin taking pictures and then headed up into the hills. The views were great and the food was excellent. The owner will take you around the hiking trails in the area, including into the mountains. Unfortunately it was cold and rainy so we did not have the chance to do that. Using that place as a base, the next morning I headed for the coast. It was raining but at least it was warm! My first destination was Tapengwan, the large lagoon east of Donggang. I had hoped to find some remains of the old Japanese base that was located in the northeastern side of the lagoon, but it is gone. Instead, the area is now undergoing upgrading with new roads, bridges, and buildings going in. The government has plans to make it a water activity center. There are more than 16 kilometers of bike trails through the area’s numerous wetlands. Aquaculture farms dot the circuit of the lagoon, and on a misty morning the fishing boats make evocative pictures. Visitors can get information about where to go and what to do at the administrative center there. Boat rides through the swamps and wetlands and other activities are already offered, with more to come. After visiting Tapengwan I went over to Donggang. Donggang is a sturdy port town with a long history. The district around the fishing port is studded with old temples of every size and description. There is a small museum, but the real highlight of Donggang is the fishing port. A working port, in the morning you can buy wholesale fish in bulk or watch the numerous workers swarm over newly-delivered fish to clean and process them. Finally, every three years Donggang hosts a famous religious festival when they burn a boat. If you have the chance, do not miss it. A couple of weeks later I returned to Pingtung for the first of eight days in Kenting, at the government’s request. The first night I stayed outside Checheng at the spa town of Sichongxi. Set in the hills, the area is filled with spa hotels. There’s a public spa as well and some low-price places to stay in town. I had been hoping to ride one of my favorite routes in Taiwan, the loop east along 199 and over the hills down to 26 on the ocean, and then back up 200. However, when I got into hills above Shihmen town, it started to rain so I turned back. The area around Shihmen has a rich history. In 1867 local aborigines slew a shipload of sailors from wrecked American ship Rover, in retaliation for the previous murder of aborigines by white foreigners. This provoked an American expedition to punish the aborigines, which landed near what is now the National Marine Museum and Aquarium. The aborigines promptly defeated the Americans and drove them back to their ships, and the US consul in Fukien, Charles LeGendre, borrowed some troops from the Qing and led an expedition from Fangliao over the hills to this area. He negotiated a treaty with the aborigines that required the Qing rulers of Taiwan to build a lighthouse in the area, which eventually became the Euluanbi lighthouse. Later LeGendre would be transferred to Japan, where he promoted Taiwan to influential Japanese. In 1871 Mudan aborigines killed 51 Okinawan sailors who had been wrecked in Kenting. The Qing rulers of western Taiwan denied that the Mudan area was theirs, so in 1874 the Japanese sent troops to the area on the pretext of punishing the aborigines. In reality, knowing that the Qing neither controlled nor claimed the mountainous aboriginal areas, the Japanese were exploring the possibility of colonizing the southern and eastern parts of Taiwan. The Japanese forces trounced the local aborigines and later, after the Qing ceded Taiwan to Japan in 1895, set up a marker on a hill above the battlefield. That marker is still visible today, and I took a few pictures on my way by. The road to Shihmen town passes through the Shih Men (“stone gates”), the gorge where in 1874 the Mudan warriors had fought the Japanese. Just down the road, a few meters east of where Rte 151 meets Rte 199 lies the tomb of the Okinawan sailors. These are important historical sites – it was the Japanese interest in southern Taiwan that finally compelled the Manchus to firm up their claim to the entire island and beef up their defenses. Hopefully the government will consider greater development of trails, historical markers and history education in both English and Chinese so visitors can get a sense of the rich history of the area. An annual re-enactment might be a good tourist draw as well. I rode down 151 through the onion fields. It was harvest time, and the fields were crowded with workers and rich with the pungent smell of onions. I stopped in Hengchun to photograph the east gate, then headed over to Manjhou to stay at the Kentingdon Resort (小墾丁渡假村, 屏東縣滿州鄉滿州村中山路205號, 08-880-2880). The Resort, set in a basin surrounded by beautiful hills, offers a large number of activities, well-equipped wood huts, swimming pools, a restaurant, and friendly and helpful staff. Highly recommended if you want a weekend getaway. On the way back I passed the famous Chuhuo Scenic Area, where natural gas seeps from the earth to occasional catch a spark and cause a fire. Manjhou township is one of my favorite places in Taiwan. The area around it feels more like southeast Asia than Taiwan. It has a rich, wet greenness that is appealing to the senses, and the people are incredibly warm and friendly. I spent the afternoon exploring small roads around Manjhou, enjoying the farming scenery, chatting with the locals, and taking pictures. The town’s landmark, a roundabout with a tree in it, makes for nifty pictures, and on the road heading north out of town there are a couple of very old shops that are local historical sites. For lunch I went out to Jialeshui, widely considered the island’s best surfing beach, and had the burger and fries at Summer Point, a cozy little place with wooden tables outside and good views of the beach and coastline beyond it. You can easily rent surfboards and other equipment in the shops there. In the morning I did one of the best little rides on the island, the stirring route along 26 around Euluanbi and into Kenting town. 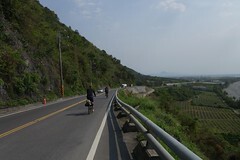 This section of road starts in Jialeshui and then climbs gently up onto the ridge above the sea. There are wonderful views back along the coast and into the hills, and good views of the sea on either side of the little peninsula. Not a difficult ride at all, but very rewarding. I went into Kenting Street for coffee, then rode up to Hengchun and back to Manjhou over Rte 200. I biked out to Jialeshui and had lunch at Summer Point, and then went to the Jialeshui Scenic Area. This amazing section of wild carved rocks under coastal cliffs is well worth a visit. Near the visitors center are cafes, restaurants and souvenir shops. Be sure to tell the people at the gate you are eating inside the park area, you get a discount that way. Your ticket entitles you to a ride on the trucks that roll along the 2 kilometers of paved path there, with guides explaining the local geology and ecosystems. In the late afternoon I moved over to the Kenting Training Hostel (墾丁渡假文教會館, 屏東縣恆春鎮恆南路38號, (08)888-3616). This clean, comfortable place is run by the local high school and the students do internships there. They are very inquisitive and easy to talk to. On the south side of Hengchun town, the hostel is centrally located and a great base for exploration of the Kenting peninsula. The next morning I decided to go hiking in the Kenting Forest Park or Sheding Nature Park, both popular hiking spots. I biked up to Sheding Nature Park, about 5 kms from Kenting town. A 4 kilometer climb, it was a good warm-up ride on a cool Kenting morning. I left the bike at the Exhibition center at Sheding Park and headed out on the trails. Sheding Nature Park and Kenting Forest Park offer a variety of climes and a large number of interesting plants and animals. The trails are clean and well-marked, and there are signs indicating flora and fauna of interest. Because they are on a hill overlooking the sea, the views are good as well. I highly recommend either of these parks for a morning excursion. From there I stopped by the Kenting National Park Visitors Center to make a date for Nanren Shan Conservation Area for the following week. The number of visitors per day is restricted and you have to register in advance to go. Unfortunately the online system is available only in Chinese. The staff at the Visitors Center are enormously friendly and helpful, but the quality of English on the signs is embarrassingly awful. With so many professional editors and translators on Taiwan, there is no excuse for a central government operation to offer such embarrassing translation. After that I decided to ride over to the Longluan Lake Nature Center. Along the way I stopped at the Sisal Monument. This is a small museum with some exhibits, but once again the quality of the English is poor. Longluan Lake Nature Center turned out to be a well designed and constructed viewing site for the numerous birds that congregate on the lake. The inside offers guides and monoculars for viewing, while there is a bird blind to enable photography on the outside. The path up to the center is a pleasant experience, lined with explanatory signs and shadowed by trees. The government has built an artificial island near the nature center to attract birds for better viewing. Totally free and well worth a visit. I also spent an afternoon walking around Hengchun town. It is not as touristy as Kenting Street and has an old town that makes a pleasant afternoon stroll. Hengchun still has a large stretch of restored old city wall that gives the town its historical atmosphere, and all four old gates are still standing. When I returned to Kenting a week later with friends, we again stayed at the Kenting Training Hostel in Hengchun. Across from it is a famous steamed bun shop that is absolutely packed on the weekends. Their steamed buns are excellent, and they will also ship bulk orders to anywhere on the island. We also found the Thai Restaurant a few blocks up the road to be quite good as well. On Saturday morning we got up early and headed out on our bikes to do the 199-200 loop back to Hengchun (a map is here: http://tinyurl.com/3ulkufr). This is one of my favorite routes on the island, offering 1000 meters of climbing with several low hills and easy grades, great views of the forested hills and the ocean, stunningly gorgeous coastline, and desolate, undeveloped seashore. Highly recommended for riding with a bike or scooter. We rode up 151 to 199 through the onion harvest. Everywhere people called to us, asking us where we were going and what we were doing. The strong scent of onions filled the air under puffy white clouds and a bright sunny sky, promising an excellent day of riding. Right after turning on to 199 we stopped by the grave of the Okinawan sailors. It is cared for today by a local family, and there are plaques in Chinese but sadly, not in English. Continuing on, we hit stopped at a curio shop in Shihmen town, the Mudan Shanchuang, and then began climbing over 199 to Syuhai. The climb up 199 above Shihmen in Mudan Township is not difficult and the views over the town and reservoir are spectacular. From there the road levels out to a pleasant, easy ride through farms and forested hills until you reach the fork where you can take 199 to Taitung, or continue on 199A down to Syuhai. Shortly after that a wonderful alpine descent down to the ocean begins, a twisting, turning road with great views over the hills to the sea. Standing on a curve looking northward along the coast where the sea cliffs tumble down to the water, you can truly understand what wild Taiwan must have looked like to mariners 200 years ago. We stopped for lunch in Gangtzai, a tiny fishing port famous for its enormous stretch of sand dunes. There you can rent ATVs to ride on the sand yourself. Many places in Kenting also offer rentals for four wheeling in the area. On the weekends the sands are filled with vehicles, and many convoys of Jeeps passed us on 200 on their way out to the sands. Leaving Gangtzai on 200, a gentle climb begins back up over the coastal ridges to Fenshuiling. There are shops there were you can grab a snack or drink. Rte 200 then begins a long downhill through some of the loveliest terrain on the island, the farmlands in Manjhou township. With great views over the fields to the wet green hills beyond, good pavement, and little traffic, this road is a cyclist’s dream. With great reluctance to leave lovely Manjhou we returned to Hengchun. Sunday was again a lovely day, so we rode around Euluanbi and then in the little farm roads between Hengchun, Guan Shan, and the ocean. On Monday we went out to Nanren Shan Conservation Area to hike the trail around Nanren Lake. I had registered for a visit the previous week. The trails are closed on Tuesday so Monday was our only chance. Nanren Shan is accessible off 200 north of Changle in Manjhou township and is only a short ride from Hengchun. At the Visitors Center we registered, showed IDs, and then viewed a briefing video. The video is required but sadly it is available only in Chinese. The 10 kilometers of trails at Nanren Shan are pleasant and well laid out, with signs explaining the flora and fauna of the area. There is plenty to photograph, including many reptiles and amphibians as well as birds and monkeys. I also spotted a walking stick and some beautiful spiders. The trail rises only 100 meters and is an easy two or three hour stroll. I highly recommend visiting this beautiful lake and its trails. If the weather cooperates, you will take some truly memorable pictures. My fifteen days in Pingtung County were a truly amazing experience of history, culture and scenery, but it is the wonderfully warm and friendly people of Pingtung who made the Pingtung experience so special. Even better, cycling makes it easy to stop and talk to them. Every place I went I had great experiences chatting with the local people, from students hanging out at 7-11 in Yujing to aborigines in Laiyi township in the mountains. Everywhere passers-by stopped to talk with me, asked me what I was doing and where I was going, and speculate on my origin (“He must be an Arab,” one group of locals decided). In little Shanhai, a seaport hamlet just south of the Aquarium, an old woman offered me some fruit, apparently just to have the chance to ask me why I had come to Shanhai. Waiting out the rain in a breakfast shop in Manjhou, it seemed like the whole town stopped in to say hello to me. Walking around in Shuimen at night I got invited to several barbecues. In Wanjin at the coffee shop several local people sat down to chat as I had my morning brew and to suggest things to do and see in the area. In the Training Hostel the students stopped by to discuss their future studies and ask my friends to help them improve their English. At the steamed bun shop in Hengchun the cashier, seeing how we had to wait for the endless lines of tourists, treated us like locals and slipped us some delicious buns out the back door. On every road local cyclists stopped to exchange greetings and discuss the road. People of Pingtung: you rock! My conclusion: everyone knows the beaches of Kenting, but few people know Pingtung. These past few weeks immersing myself in the people, culture, history, and landscape of Pingtung County have been both great fun and a great learning experience for me. I’ll be cycling these roads again soon, and I hope to see you on the road in Pingtung when I do! Not feeling well tonight and can't bring myself to write another one of my awesomely insightful (or annoyingly shallow, as you will) blog posts, so enjoy some visuals. The video above is a couple of minutes of images from the Japanese colonial period. The music is good. This still is from Marinetraffic.com. It offers realtime updated pictures of ships and boats and other nautical stuff in the waters of the world. Way cool. More nasty Nazi Kitsch. One side says Waffen SS, the other, Das Reich, the name of the SS division responsible for the Orodour-sur-Glane massacre. As one friend on Facebook noted, you can maybe imagine some people don't get it, but this one, he must know what he has there. Morning at the Confucius Temple in Tainan. This week I did a whirlwind tour of Sandimen, Kaohsiung, Tainan, and Taoyuan. I went out to Erkunshen bastion with Dom, who did the dull Century ride from Taichung to Tainan this week. It's my favorite of the Tainan forts. Well worth a visit if you haven't been there, but be sure to get the number of a cab company; it is hard to get a cab back from out there. I'll conclude with more dictator kitsch, this one from the Daxi Artists Villa in Daxi in Taoyuan. The place is actually a restaurant in one of the dictator's more than two dozen residences in Taiwan. It is a memorial in kitsch to the Chiangs; you can drink Soong Mei-ling Tea and browse the souvenirs. Naturally none of the history of the residence's previous use by the Japanese is represented. 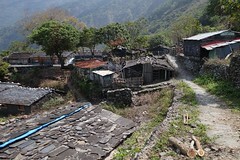 One of the post-Morakot villages built for aborigines moved down from the mountains, this one in Majia township above Shuimen town. President Ma Ying-jeou (馬英九) yesterday announced that his administration would push for legislation and revision of laws on land expropriation, real-estate transaction prices and social housing projects to provide more protection for landowners and a more equitable use of land and housing to curb property hoarding. Ma told a press conference at the Presidential Office that the Executive Yuan would pass a revision to the Land Expropriation Act (土地徵收條例) proposed by the Ministry of the Interior and send it to the legislature for approval. Under the proposals, local governments will evaluate land transaction prices of expropriated lands every six months, and compensation for landowners will be calculated according to market value rather than the published value of the land, which is often much lower than the market value. Major solutions to curb unjust land seizures and housing prices include the establishment of a database of real-estate transaction prices to make the information transparent, taxation of unused land to prevent land speculation and housing legislation, he said. Taiwan's houses also have two prices -- the actual market price and a "standard unit price for housing construction" set by the tax revenue offices of each local government for residential units under their jurisdiction. This publicly assessed price has not been adjusted for 27 years. Legislator Lai Shyh-bao estimates that the current "standard unit price" is roughly only one-fifth of the actual market value. You can see that by keeping the publicly assessed prices low, land speculators can make enormous profits and local governments can grab land at low prices. A database and revisions to the laws would help a lot. Today some of the proposals were presented in the Taipei Times. However, a long list of exception are to be made in the case of use by the military, transportation, public utilities, irrigation, sanitation and environmental protection or major construction projects approved by the Executive Yuan, Jiang said. If the legislature passes the bill, land developers would be required to evaluate how their projects would impact an area in terms of economics, social-cultural effects, bio-diversity and the environment before a comprehensive assessment could be made as to whether a project is necessary and whether it brings with it countervailing public benefits. The bill would also require that land developers negotiate prices with land owners facing expropriation based on market price, thereby addressing one of the major criticisms at present, that -government-declared valuations have been too low. The current environmental impact assessment system is largely toothless; to date no project has been stopped by its EIA and there are few provisions for oversight of changes in a project mandated by an EIA. It is simply pro forma. Hard to believe that the assessment mandated above will be much different. Also note the exception: projects approved by the Executive Yuan. The Central Taiwan Science Park, one of the major causes of the land expropriation protests, is an Executive Yuan project run by the National Science Council (NSC). The legislation pointedly ignores the major problem it is meant to address. Business as usual. Still, some of the proposed changes, including set-asides for lower income families and farmers, seem to mean well. The question is how they will work in reality. The China Post has a very detailed report on how the reform to report market prices for homes is going to work. Dean Cheng at Heritage points out the inconsistency of the Administration's position on Taiwan arms: it acknowledges the threat to Taiwan but does nothing about it. An Author road bike was stolen from a car. Please contact Drew if you see it. Thinking about a car for your bikes? Drew also has a post on his Honda Fit. Dear AP: The DPP does not "oppose expanded China ties." It opposes selling out Taiwan to obtain such ties. You waste all those words explaining Taiwan's relation to China incorrectly; the least you could do is explain the DPP's position correctly. Chen Shui-bian found not guilty in embezzlement case. The Journalist with 2012 election poll: Shows the same gap, Ma over Tsai at +5 that most polls show, and another phenomenon other polls have shown: with Soong in as Presidential candidate, Tsai's support drops, relatively speaking. Thought I'd add this: just as Taiwan's demand for gravel has caused environmental problems all over Asia, so with Singapore and sand. The parallels, including the rapacious developers, are there. AP reports that Congress might actually bestir itself and sell the F-16s to Taiwan; it seems that this has strong support on both sides of the aisle. In May, nearly half of the Democrat-led Senate sent a letter urging Obama to authorize the deal. There is likely even broader support in the Republican-controlled House. Giving the green light would set back Obama's efforts to cultivate a stable, cooperative relationship with China, which has reacted to previous arms sales to Taiwan by cutting military ties with the U.S. This paragraph really bothered me. The rest of the piece is just boilerplate Establishment reporting terminating in AP's "split in '49" nonsense. But I don't like the way it turns Congress into the villain and Obama into the hero; the situation is quite different. Meanwhile, the DoD gave its annual 2011 report to Congress this week. The big news was that China remains focused on Taiwan, is rapidly expanding its edge over Taiwan, and appears to be conducting cyberwarfare. As one wag I know remarked, the report appears to be a lagging indicator. The DPP has released the National Security Chapter of the 10 Year Policy Outlook. The chapter comprises three parts (Trends and Challenges, Core Principles, and Policy Positions). Below is the full text translated into English. The current trend in globalization will continue to develop for the next two generations. Under this trend, a visible world with traditional state boundaries will co-exist with an invisible societal network connected by mega-cities through information, capital, trade, technology, services, and migration. This in turn will strengthen the political, economic, social, and cultural connections between states, and deepen mutual dependence. At the same time, globalization will produce far more complex transnational and non-traditional security challenges, such as wealth disparity, climate change, energy shortages, economic crises, and terrorism. These challenges will impact in an unprecedented way the form and governance of traditional states. Under the broader trend of globalization, shifts in the axis of the world’s rapid economic growth and the changing flow of economic strength will promote the rise of emerging powers, most notably, China, India and Russia, impacting the world’s geopolitical and strategic conditions. Even though it continues to be the world’s only superpower, the United States’ uni-polar dominance has eroded. An unbalanced, multi-polar international system is taking shape, with emerging and traditional powers seeking their own individual polarity where each has a role in determining world order alongside the United States. From a historical perspective, it is not yet clear how each emerging power can manage to form a new, more complex international system with existing powers. In the coming years, the rise of China will be a key factor in this dynamic. In East Asia, the US-Japan security alliance has been one of the cornerstones of security, but China’s rise impacts this system, thus affecting the new regional security order. Such strategic developments and changes represent a reality that must be faced as Taiwan strives to maintain its national security goals of prosperous development, democratic freedom, and secure survival. Due to historical factors, the two sides across the Strait have been in a long stalemate. Despite increasing exchanges over the past thirty years, the stalemate remains although in a more hidden form. At the core of the stalemate lies the dispute over sovereignty, and furthermore, the two sides continue to hold considerable differences in values, perspectives, and governing systems. Thirty years of interaction have complicated the situation across the Strait. The close involvement of economic engagement is unprecedented. Yet at the same time, their separate values, perspectives, and systems have not merged, and to some extent, even diverged. Furthermore, with three decades of reform, China has risen with the ability to project power on a global level, but some indications show that China is entering a development stage where uncertainty exists in its political, economic, social, and cultural prospects. Political reform remains far away, economic development has moved in a direction of state capitalism, social divisions and conflicts are deepening, yet all while the ghosts of Maoism continue to hover over Chinese skies. Thus the international community is generally concerned about whether China, as it rises, will act as a “responsible stakeholder” in the new international system and play a role as a constructive global power, or try to achieve a “China rise” in the style of a “great national revival” that is inspired by an expansionist nationalism. China’s choice is relevant to global development, to regional peace and prosperity, and of course to Taiwan’s national security and development. Since Ma Ying-jeou took office in 2008, his administration has ignored the complexities of the overall development of Chinese society. It has also neglected to preserve Taiwan’s subjectivity while interacting with other countries in a globalized world. Taiwan’s sovereignty has been degraded as the Ma government simplistically views China as the only path to rely upon for Taiwan’s security and development. It has gradually marginalized Taiwan’s security and development by making Taiwan a “dependent variable” in China’s uncertain development. Since the days of world maritime navigation, Taiwan has been a part in globalization, and experience shows that Taiwan’s survival and prosperity are dependent on our ability to fully understand the broader historical environment and become part of it while making good use of our circumstances. At the moment, we, Taiwan, are situated in the middle of a continuously developing globalization trend, in addition to facing China and an evolving international system. In this evolution, China is not only a key determinant but also the most unpredictable factor, where the intentions and prospects of its rise are opaque and uncertain. For Taiwan, China is a possible opportunity for development, yet at the same time it carries an unfriendly attitude toward Taiwan’s sovereignty. All these conditions create the major challenges for Taiwan’s national security and development. As a member of the global community, as Taiwan faces the opportunities and challenges brought upon by the development of globalization and the rise of China, Taiwan must responsibly look at the changes in the broader environment, and respond to these changes with new strategic thinking. Only then can Taiwan face up to challenges, maintain security and the dignity of its values while developing prosperity and contributing to peaceful development. As a party founded in this land, the Democratic Progressive Party is bound by this duty. 1. Universal values of justice: Taiwan is a young democracy. The pursuit of the values of democracy, freedom, human rights and green development has been the principal driving force behind Taiwan’s democratization process. The Democratic Progressive Party believes that when it concerns foreign and security affairs, Taiwan should continue to uphold these principles of justice as the basis for international cooperation and exchange. Therefore, Taiwan has the right to participate fairly in international affairs and the sharing of resources, but it also has the duty to actively partake in and contribute to international cooperative efforts, and to do its best to fulfill its responsibilities as a member of the international community. 2. Balanced external relations: Taiwan’s development has always taken place through interactions with the whole world via unobstructed sea-lanes. The Democratic Progressive Party believes that in the era of globalization, Taiwan’s external relations should be conducted within global and regional frameworks that include the complete picture, developing a balanced global strategy, consolidating direct links to the globally networked society, actively partaking in global and regional security affairs, expanding regional collaboration, and building Taiwan’s political, economic, social, cultural and military and security networks. 4. Democratic consensus in society: Taiwan is a young, multi-ethnic and immigrant society with diverging opinions about national identity and a volatile social consensus. The Democratic Progressive Party believes that in order to build democratic public consensus and to strengthen a social and national identity that centers around modern citizenship, any foreign or security policy that concerns Taiwan’s core interests, including decisions about Taiwan’s future, changes in the current status of independence, as well as the formulation and implementation of important foreign policies, should be decided upon in accordance with the principles and procedures of democracy. 5. A secure defense mechanism: In addition to the Chinese military threat and China’s “Three Wars” approach (the legal, psychological, and public opinion wars), Taiwan also faces threats to its territory and environment, as well possible epidemics, destructive terrorist attacks and other non-traditional security threats. The Democratic Progressive Party believes that in response to both these new and these traditional security threats, we must strengthen the awareness of security issues among the people, build vigilance, and prepare a security and defense mechanism that can respond to military threats and crises, thereby ensuring Taiwan’s national security and the security of its people’s property. 1. Uphold universal values of fairness and justice to serve as a shared basis for international engagement: The biggest difference between Taiwan and Communist China lies in Taiwan’s pursuit of values such as freedom, democracy, and human rights. The Democratic Progressive Party advocates that Taiwan must conduct its exchanges with the international community, share its democratic experience, pursue progressive values, and create common strategic interests based on this moral foundation. On numerous transnational issues such as energy resource shortage, climate change, environmental pollution, poverty, epidemic prevention and terrorism, Taiwan as a member of the global village, albeit not a formal member of the relevant international organizations, should contribute and fulfill its international duties to the best of its ability in order to advance international harmony and promote the well being of humanity. 2. Reinforce the strategic partnership with the United States: The United States has occupied a decisive position in Taiwanese security affairs for a long time. A long-term and friendly relationship of strategic cooperation exists between the two countries. The Democratic Progressive Party believes that for the future, Taiwan must proceed to strengthen this strategic partnership, rebuild and deepen strategic mutual trust and strategic consensus, effectively coordinate Taiwan-U.S. interests in every respect, strengthen the institutional arrangements for Taiwan-U.S. engagement on security matters, and increase the depth and breadth of trade, social, and cultural cooperation. 3. Strengthen cooperation with countries in the Asia-Pacific region, and protect regional peace: Because of geo-strategic and historical reasons, Taiwan has had close relations with Japan. South Korea, ASEAN, India and other countries in the Asia-Pacific region are currently facing the common challenge of a rising China. The Democratic Progressive Party believes that Taiwan should continue to deepen its ties with Japan, as well as actively intensify cooperation and dialogue with other countries in the Asia-Pacific region, project soft power, enhance existing ties, strengthen trade and investment links, promote public diplomacy, advance closer exchange and cooperation between NGOs and other private entities, build closer political, economic, social, cultural and security relations, strengthen cooperation on regional affairs, and jointly safeguard security and peace in the region. 4. Build a stable mechanism through a strategic approach of mutual interest: The core of the problem in the cross-strait strategic stalemate concerns conflicts over sovereignty. We acknowledge that Beijing insists on its “One-China Principle” position. However, Beijing must also understand the reality that the Taiwanese people, having gone through the historical processes of freeing themselves from foreign rule and seeking democratization, are opposed to a one-party system and committed to upholding the independence of their sovereignty. The Democratic Progressive Party believes that Taiwan and China must reach an understanding that is based on reality and the fact that the two sides are different, yet at the same time express a shared desire for seeking commonality and strategic mutual interests, all with the goal of developing a stable mechanism that would benefit the pursuit of peaceful development on both sides. 5. Construct a framework for peaceful and stable interaction between Taiwan and China: The process of seeking strategic mutual interest between Taiwan and China must take place through exchange, dialogue, the settlement of differences, and conflict management. The Democratic Progressive Party believes that both sides, under the principles of equality and reciprocity, should engage in multilevel dialogue to exchange views on multilevel and multifaceted topics, and establish mechanisms for solving relevant issues. Through such mechanisms, and by gradually building a multilevel and multifaceted "cross-strait framework for peaceful and stable interaction" for dealing with issues, we seek to sustain a stable and constructive bilateral relationship. 6. Promote balanced China-Taiwan trade relations within the global trade picture: Ever since maritime navigation has taken off, Taiwan’s international trade activities have been balanced and outward-oriented. The Democratic Progressive Party believes that with the present trends in globalization, Taiwan should adopt a balanced approach toward its economic and trade strategy with cross-strait trading activities being an important part of its global outreach. Particularly at a time when China’s economic development is moving more and more towards a special type of state capitalism centered around powerful elites, Taiwan should conduct its dealings with China in concert with the rest of the world in order to respond to this special Chinese form of development. 7. Promote diverse diplomacy through soft power; obtain the support of the international community: Taiwan is a country that successfully transitioned from an authoritarian developing state to a developed young democracy, and one which has gathered considerable experience in terms of economy, values, culture, and technology. The Democratic Progressive Party believes that Taiwan should value this kind of soft power, as well as put the power of civil society to use, promote diverse diplomacy, and tell the international community the success-story of how 23 million Taiwanese people pursued democracy, freedom and justice under unfavorable circumstances at home and abroad. Taiwan should also strive to obtain the support of the international community, actively participate in international humanitarian relief efforts and contribute to finding a solution for transnational issues such as climate change, environmental pollution, poverty, and the prevention of epidemics. 8. Advance multifaceted social and cultural exchanges between Chinese and Taiwanese civil society: The robustness of Taiwanese civil society is an important foundation for Taiwan’s successful democratization. Over the past few years, there have been indications that China’s civil society has been slowly and painfully growing, and that it may turn into an important factor for China’s developing in a more positive direction. The Democratic Progressive Party believes that in light of the experience in Taiwan that civil society has played a positive role in its historical development, Taiwan should be concerned with the development of civil society in China, and promote multilevel and multifaceted social and cultural exchanges and dialogue between the civil societies of both sides. 9. Demonstrate the commitment for self-defense, and strengthen the military to protect Taiwan: “Peaceful development” and reconciliation may be the current mainstream talking points. However, we cannot depend solely on the other side’s benevolence for “peace.” Instead, the Taiwanese people must demonstrate a will and a commitment to self-defense to obtain peace. The Democratic Progressive Party believes that in order to safeguard Taiwan’s peace, security, as well as to protect its people’s lives and property, Taiwan must continue to make preparations for a security and defense mechanism that can respond to Chinese hostility or threats to Taiwan’s territorial security. Furthermore, Taiwan must continue to engage in a transformation of its national defense, build renewed awareness of security among its citizens, integrate resources effectively, advance overall military capabilities, and improve contingency response measures. 10. Actively participate in regional security matters; strengthen regional security cooperation and exchanges: In a globalizing world, security matters increasingly require transnational cooperation. The Democratic Progressive Party believes that Taiwan must assure the international community that it will neither develop nor deploy weapons of mass destruction, including nuclear and biological weapons. Taiwan should also seek to expand cooperation with nearby Asia Pacific countries by strengthening transnational cooperation on counter-terrorism and cyberspace security, as well as playing a more active role in international humanitarian aid programs and safeguarding the security of navigation through international waters. 11. Improve maritime law, and manage Taiwan as a maritime country: Taiwan is a maritime country. In order to effectively defend its rights and interests, improve the management of maritime resources, and adapt to changing circumstances, Taiwan must improve legislation of the maritime legal system based on a “Basic Law of the Sea” as soon as possible. Secondly, in order to manage and operate maritime resources effectively, to protect maritime rights and interests, and to strengthen international exchange and cooperation on maritime affairs, Taiwan should promptly integrate and reorganize the decision-making and administrative mechanisms related to maritime affairs. 12. Establish a multilateral consultation mechanism to cooperate in maritime resource development: Taiwan is surrounded by seas on all sides. The surface area of its territorial waters is larger than its land surface, while the waters that are marked as Exclusive Economic Zones are even larger. However, due to the fact that the surrounding countries have different views on rights involving maritime space and the use of related resources, conflict occasionally arises. Therefore, Taiwan’s maritime sovereignty and the right to use its maritime resources are under constant threat. The Democratic Progressive Party believes that the disputes and conflicts related to waters surrounding Taiwan, including the South China Sea, should be resolved by those countries whose interests are affected, as well as within a multilateral framework, and in the spirit of “joint development and setting aside controversies.” The DPP supports the establishment of a multi-lateral consultation and dispute settlement mechanism under international law to enable cooperation in areas such as maritime resource development, pollution prevention, and navigation security, with the goal of jointly maintaining the sustainability of maritime resources as well as peace and security on the seas. The other day I remarked that I ought to start a pool on how long it would take before establishment analysts started labeling Democratic Progressive Party (DPP) Chairperson Tsai Ing-wen (蔡英文) a “troublemaker” if she became president. However, I see David Brown has trumped my cynicism by deploying that trope before Tsai has even been elected (“DPP must clarify its China policy,” Aug. 19, page 8). You can read the rest here. The original was much longer, I had to cut out everything that makes for good writing and just put in a lot of bare sentences, as well as several other ideas I wanted to convey. Brown's original commentary is here. What can we look over today? The other swimming hole at Red River Gorge. Drew on the Wuling Neverstop Challenge. Pat Cowsill looks at some interesting items in the British Consul Reports on the 1895 takeover by Japan. Oz on what happens when local parents overwork. Steve Crook highlights the work of Fred Lobb in writing books on folktales and proverbs from Taiwan. Letters from Taiwan on more Chinese fighter incursions in the Strait. Pinyin Info on the journal Sino-Platonic papers run by the awesome Victor Mair. That's Impossible! on the One China, Two interpretations of the DPP. As they saw it: a perfectly ordinary 1976 report on Taiwan. Chinese military slip up reveals that PRC military is source of cyber attacks on US. Taiwan government loses spy and arms dealer. WSJ: "That Beijing and the Southeast Asians have wasted nine years on a single point of no practical consequence illustrates another reality: They are engaged essentially in a political-diplomatic propaganda game rather than a serious attempt to manage potential conflicts in the South China Sea." Commonwealth on the latest in the Endless Reform of Taiwan's educational system. Bonnie Glaser on Chinese perceptions of US power. China outpaces India in the Himal. The DPP's Ten Year platform China Policy is out. Researchers from Taiwan and the UK report that global warming is driving animals to new ranges at rapid rates. South China Sea, US policy, ASEAN. From Heritage. WantChinaTimes reports DPP fears collapse of housing bubble if Tsai is elected. AP reports on Seediq Bale, the hope of Taiwan's film industry. The Dachen wetlands petrochemical complex continues to live, zombie-like, in weakened form.